Arnoff Moving & Storage's New York records management services provide a solution to storing your files and documents. There's no way around it -- no matter what kind of office you have, you have paperwork that is important and needs to be retained. That means taking up valuable space that could be used more efficiently. Our records management services and storage facilities offer you the ultimate in security and easy access. Fireproof and equipped with dry sprinkler systems, they are security monitored and feature private auditing rooms for use by our clients. Specially designed areas for storing tapes, x-rays and computer files are available, and your files, documents and records are always accessible to you. All items are barcoded for immediate retrieval, and we offer you the convenience of pickup and delivery. Why pay high square-footage office rents for document storage when you can have the ample storage area that Arnoff offers you – at the most competitive prices. That's a small price to pay for the peace of mind knowing your important documents are in the safest place they can be. Storing your records with Arnoff will free up valuable space and save you money. Off-site storage adds flexibility to your storage space needs – you will only pay for the space actually used for storage of your files, and the amount of space used can more easily expand and contract that your office space. Our New York records management improves your office efficiency and saves you valuable time and money by letting us do the work. We can design storage programs to specifically suit your particular needs and will work closely with you to decide which records should be sent to storage. We will always suggest the most efficient, timely and economical way to handle pickups and deliveries. Arnoff is here to help you. 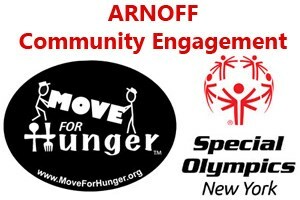 Arnoff is proud to serve New York's Hudson Valley, Massachusetts, Connecticut and the Fort Pierce area in Florida for their records management needs.